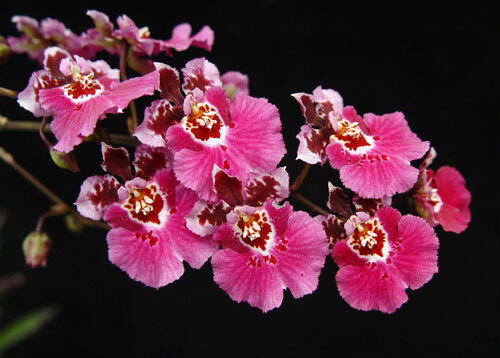 The miniature Equitant Oncidiums originated in the Caribbean. These are great compact plants that are easy to grow for any beginner. These plants can often bloom more than once a year. Larger specimen plants or large collections of Equitants can provide some blooms most of the year round. Equitants come in many shades of colors and have flowers that can be solid in color, spotted or barred. These delicacies can be found growing in their native habitats on small twigs at the ends of trees in high light exposed conditions. Therefore, they do well growing in an east window receiving sunlight from early in the morning until 11:00 or 11:30 a.m. They can also be grown in a south window as long as a sheer curtain is used to diffuse the light. If you are growing the plants under fluorescent lights, be sure you supply some incandescent light to make up for the end of the light spectrum. This will insure proper blooming. L.E.D. Grow Lights can provide more than enough light for healthy growth and frequent blooming. Distilled, reverse osmosis or Rainwater is best as this is the quality of water they get in their natural habitat. Watering should always be done in the morning to insure total evaporation from the leaves by nightfall. Be sure to allow your plants to become totally dry between watering. On a slab, it usually means watering every day. In clay pots, potting in charcoal or tree fern, this can mean once every three days to once a week depending on the humidity and air movement around the growing area. Equitants like intermediate temperatures. They prefer a low of 60° F at night and a daytime temperature between 70-80°. They also love to be grown outside as long as the night temperatures do not fall below 50°. For tap or well water, fertilize every other watering at the rate of ½ teaspoon per gallon using GrowMore 20-10-20.